The internet is full of photos of cats sitting on their owners laptops or keyboards, often scratching hands that get too close and sending gibberish emails. There is only one logical solution to this furry predicament: give cats their own computers. Now, SuckUK has made this dream a reality. 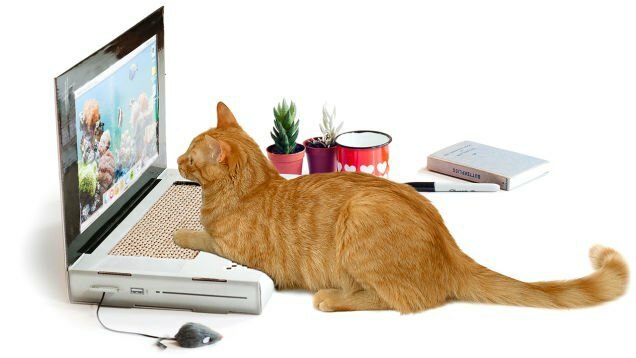 Their Cat Scratch Laptop is a laptop shaped foldable cardboard box, complete with a scratching post where the keyboard should be. And of course, it comes with a mouse. "If you want to upgrade the operating system or install new applications, simply print a new screen on paper and slide it inside," they write. Even technology is easier for cats. The toy is available for $35 online.